GreekGirl fills a void in the protein offerings for women: A post-workout protein supplement that enhances skin, hair and nails, supports lean muscle and provides satiety for a busy woman’s day. It’s a first-of-its-kind Greek and whey protein blend offering timeless benefits internally while revitalizing your skin with that healthy glow. GreekGirl is an opportunity for every woman to be beautifully fit. This product presents benefits to all women who are already used to, or are getting acclimated to a hectic lifestyle, but still take their personal health and outward appearance seriously. Daughters, sisters, moms, nieces, aunts, best friends and even grandmothers: GreekGirl is there for any woman who wants to feel beautiful, inside and out. So just who is GreekGirl? Creator of GreekGirl Beauty Protein, Kathryn Sansone, is a mom, a wife, a friend, a sister…and she’s busy. Author of “Woman First, Family Always,” Kathryn shares the importance of caring for yourself so that you can nurture those around you. A GreekGirl believes that caring for yourself means making time to do the things your body needs to stay healthy, happy, and beautiful. With a strong belief that beauty does indeed start from within, Kathryn had an idea to make adding everything you need for beautiful hair, skin, nails, and health into one great tasting drink. As a mother of ten, Kathryn knows how busy and challenging life can be. A certified fitness instructor, Kathryn makes exercising and eating healthfully a priority and helps to encourage those around her to do the same through sharing her tips, tricks, and experiences. A cheerleader for women everywhere, a fan of fitness, and work-life balance evangelist, Kathryn Sansone is a GreekGirl…and so are you! Kathryn is up to so many positive things, find out more at ShapeUpMom.com. Kathryn created GreekGirl Beauty Protein drawing from her ancestry in Greece. In Greece, beauty regimens focus not only what you nurture on the outside but on the inside, too. A well-balanced diet has a large emphasis on fruits, vegetables and healthy fats, in addition to protein! 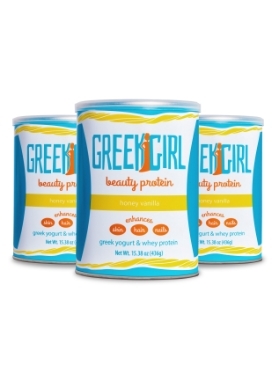 GreekGirl Beauty Protein is designed for nourishing your beauty with a blend of whey and yogurt protein, vitamins, and minerals. GreekGirl is an opportunity for every woman to be beautifully fit. Kathryn reminisces about making yogurt with her Yiayia (see photo to the right) and how she was inspired to use yogurt in Greek Girl Beauty Protein.